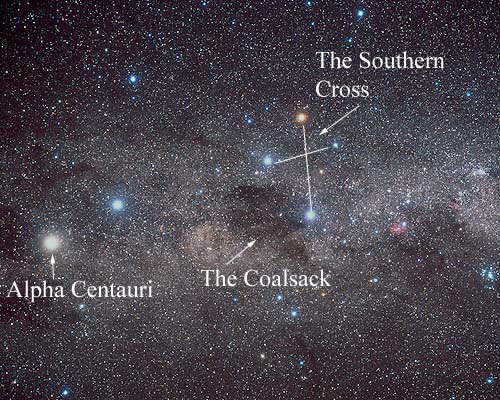 The image on the preceding page was created to demonstrate that Alpha Centauri is not a star, but really a star system. Of the three stars in the system, the dimmest - called Proxima Centauri - is actually the nearest star to the Earth. The two bright stars, called Alpha Centauri A and B form a close binary system; they are separated by only 23 times the Earth - Sun distance. This is slightly greater than the distance between Uranus and the Sun. 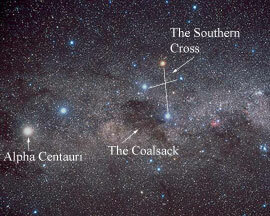 The Alpha Centauri system is not visible from much of the northern hemisphere. 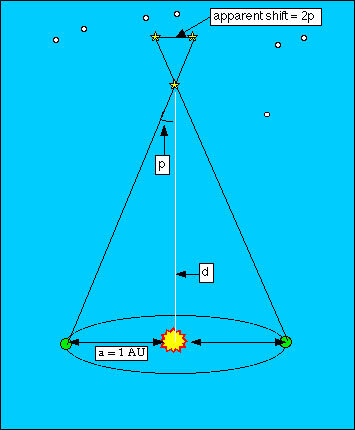 The below image shows this star system and other objects near it in the sky. Image Credit for Alpha Centauri photo: Copyright Akira Fujii / David Malin Images. Proxima Centauri, the closest star to our own, is still 40,208,000,000,000 km away. (Or about 268,770 AU.) When we talk about the distances to the stars, we no longer use the AU, or Astronomical Unit; commonly, the light year is used. A light year is the distance light travels in one year - it is equal to 9.461 x 1012 km. Alpha Centauri A & B are roughly 4.35 light years away from us. Proxima Centauri is slightly closer at 4.25 light years. The methods astronomers use to measure distances to the stars are pieces of fundamental and active work in astronomy with important implications for how we understand the Universe around us. One of the most accurate methods astronomers use to measure distances to stars is called parallax. If you hold your finger in front of your face and close one eye and look with the other, then switch eyes, you'll see your finger seem to "shift " with respect to more distant objects behind it. This is because your eyes are separated from each other by a few inches - so each eye sees the finger in front of you from a slightly different angle. The amount your finger seems to shift is called its "parallax". Stars are not actually stationary objects! The Galaxy is rotating, and the stars are in orbit around its center. Not every star moves at the same rate - how fast they orbit can depend on where the star is located within the Galaxy. Our Sun, being fairly far from the Galactic Center, takes over 200 million years to circle the Galaxy once. Some of the stars near us are moving faster than us, and some slower. As Phil Plaitt, from Bad Astronomy says, "...like cars on a highway, stars continually pass each other as they orbit the Galaxy. They change positions, slowly, but measurably." The Voyager 1 spacecraft is on an interstellar mission. It is traveling away from the Sun at a rate of 17.3 km/s. If Voyager were to travel to Proxima Centauri, at this rate, it would take over 73,000 years to arrive. If we could travel at the speed of light, an impossibility due to Special Relativity, it would still take 4.22 years to arrive! Why Can't We Travel Faster Than the Speed Of Light? According to Special Relativity the mass of an object increases as its speed increases, and approaches infinity as the object's speed approaches the speed of light. This means that it would take an infinite amount of energy to accelerate an object to the speed of light. There's no fundamental reason why we can't get as close to the speed of light as we like, provided we have enough energy. But this is probably far in the future.